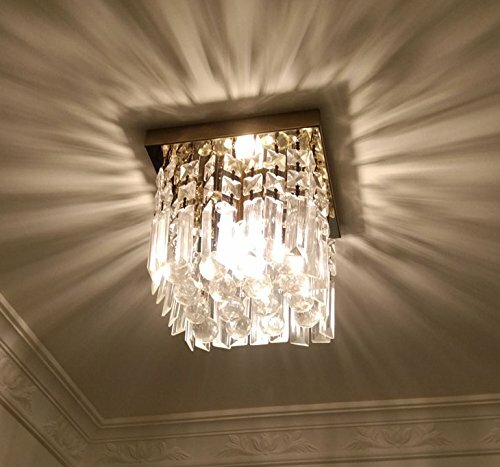 ● This crystal chandelier is assembly required, but definitely worth it. The chandelier is stunning and gorgeous in person. ● Each crystal strings are packed individually to avoid the breakage during shipping. ● Please check carefully the instruction manual before installation and follow close to it. ● It will be more helpful and safe, if you have a professional licensed electrician. Moooni lighting focus on design and produce high quality contemporary crystal chandeliers since 2009, 100% Brand New. We assure you that you will get a 100% sincere customer service. We guaranteed 100% Refund/Replacement if there has quality problem issues. Lighting Bulb: 1 x G9 LED (Max 7W) bulb. ( NOT Included) Note: This ceiling lamp does not support the use of halogen bulbs, buyer can search "moooni dimmable G9 LED bulb" and choose the LED color. Chandelier Size: Width 8"/20cm, Height 7"/18cm. Recommended for use as a decorative light. Application Space: Bedroom, Dining Room, Lockers, Kitchen, Craft Room, Shop, Foyer, Hallway, Staircase, Etc. Easy assembly required. If you have any questions about the installation, please contant us on Amazon, we will repond you in 24 hours, we promise to give you 100% satisifation service. If you have any questions about this product by Moooni, contact us by completing and submitting the form below. If you are looking for a specif part number, please include it with your message.